State Street Village, designed by acclaimed international architect Helmut Jahn, consists of three five-story buildings which face the primary thoroughfare running through Main Campus. One of its most distinctive features is that the Green Line elevated train runs behind it—giving this residence hall a distinctly Chicago-type vibe! 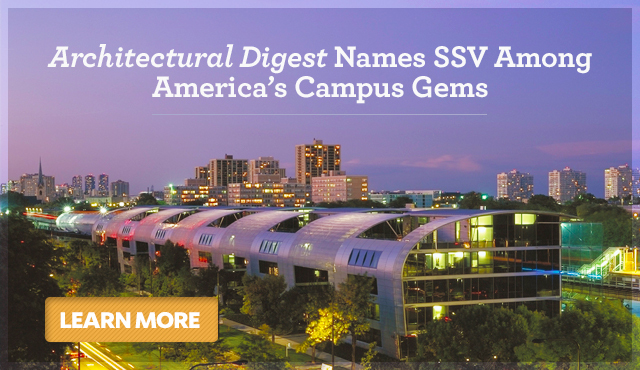 SSV offers 367 beds in two suite-style buildings (two students per bedroom) and one apartment-style building (one student per bedroom). Take a virtual tour here! To reserve your room in SSV, click here. Campus housing is available on a first-come, first-served basis. It is recommended that graduate students submit contracts for housing as early as possible. Click here for room pricing. 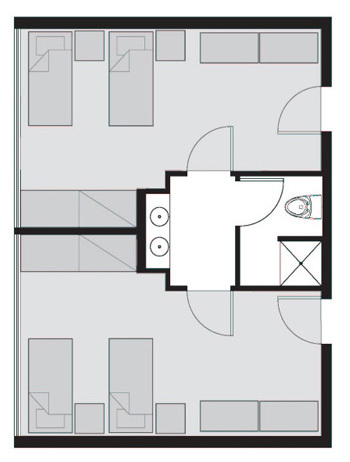 Notes: All floor plans, room sizes and furniture depictions are approximate. State Street Village is fully furnished. Each resident is provided a study desk with chair, a dresser, and a extra-long twin mattress with bed frame. 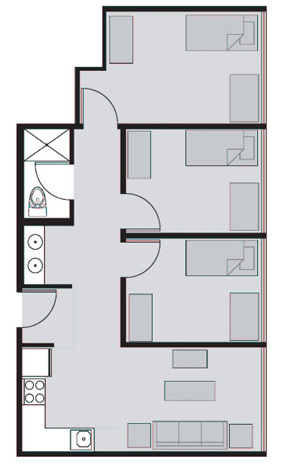 In addition, each State Street Village South apartment is furnished with a couch, and the kitchens are equipped with a microwave and refrigerator. Current SSV residents who intend to live on campus during the summer or the following academic year must take part in the summer reservation or the returning resident reservation process, both of which take place on My Room. For more information, contact Office of Residence Life by phone (312.567.5075) or e-mail (housing@iit.edu). Can furniture be removed from the apartment? Residents cannot remove University provided furniture. Residents needing accommodations can request furniture removal. Who is eligible to live in SSV? SSV North and South are reserved for returning upperclassmen and graduate students. SSV Middle is reserved for incoming first year students. Can students with families or dependants live in SSV? Students with families or dependents cannot live in SSV. Contact the Office of Residence Life to review available options. How do students pay for SSV? Residents make all payments through the Student Accounting Office. Payments are due each semester, similar to tuition. What are the cancellation terms of the SSV contract? Important cancellation terms and deadlines can be reviewed in the 2019-2020 Room and Board 2 year contract Freshmen Residents or 2019-2020 Room and Board Contract Terms. State Street Village does not allow pets. Service animals are permitted. Contact the Office of Students with Disabilities for additional information. All campus housing is compliant with State of IL indoor air quality policies. Smoking is only permitted outside of the building. No pre-payment is required for on-campus housing.